Responding to criticism of the self-serving Atlantic Yards fiscal impact study he prepared on behalf of Forest City Ratner, sports economist Andrew Zimbalist told the 6/29/04 New York Times, in an article headlined A Plan Passes And an Arena Is Protested In Brooklyn, "I was very careful in my use of numbers." I'd call that a classic example of the "journalism of assertion" the Times purportedly eschews in favor of the "journalism of verification." While I've spent a lot of time dissecting Zimbalist's work, I--and everyone else, I believe--missed a sloppy, careless error that was not fundamental to his argument but exemplifies, I'd argue, the casual manner in which he prepared his for-hire study. That math error misreported the number of estimated jobs. Beyond that, Zimbalist, as if oblivious to any responsibility for verification, missed the news that a new arena was coming in Newark. Mr. Zimbalist is the nation's leading expert on the financing of sports arenas and co-author of the bible on the subject, a report issued by the Brookings Institution called Sports, Jobs, and Taxes: The Economic Impact of Sports Teams and Stadiums. He has a national reputation for arguing against the use of public dollars to pay for sports arenas. But even Mr. Zimbalist likes the proposed Brooklyn arena deal. It also led to slapdash coverage like a New York Post article headlined "NETS GOOD SPORT$," in which Gersh Kuntzman (now editing the Brooklyn Paper) asserted that "developer Bruce Ratner's proposed arena for the New Jersey Nets in Downtown Brooklyn would pump more than $800 million into city and state coffers over the next 30 years." Neil deMause noted that the sum referred to revenues from the entire project, not just the arena, prompting Kuntzman to comment that, while he understood Zimbalist's findings, he was just using "shorthand." And, as I've learned from a look at his curriculum vitae (as of 2008), Zimbalist did not simply do one report for Forest City in May 2004 and update it in June 2005. He produced a supplementary report in July 2004; an updated report in January 2005; a second updated report in June 2005; a June 2005 document comparing the May 2004 and June 2005 reports; a third updated report in May 2006 and a fourth updated report in November 2006. To my knowledge, none but the May 2004 and June 2005 reports were released publicly. The substantial amount of time Zimbalist was retained suggests that he did have time to address the significant criticisms raised, such as in the June 2004 Kim/Peebles report or my March 2006 critique, but never did so publicly. In his initial report (below), dated 5/1/04, Zimbalist stated Atlantic Yards would contain 7599 office workers (2533 x 3) in 1.9 million square feet. That's confirmed by doing the math: 1,900,000/250 sf per worker = 7600 spaces. In his follow-up report (below), dated June 2005, Zimbalist mistakenly asserted there would be 1461 office workers (487 x 3) in 1,217,505 square feet. That math doesn't add up. Actually 1,217,505/250 sf per worker = 4870 spaces. What about that Newark arena? As Gustav Peebles and Jung Kim pointed out in their June 2004 response (below) to Zimbalist, that left no place for the New Jersey Devils to play hockey. 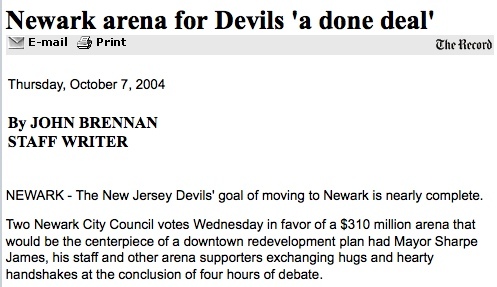 By the time of the 2005 report, Zimbalist either did not notice or chose not to acknowledge that a new arena was coming in Newark, as indicated in the below 10/7/04 report in the Bergen Record. This is the world's most famous sports economist?